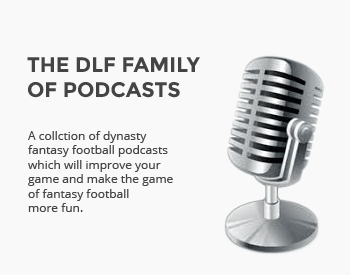 For many dynasty players, the highlight of the off-season is the annual rookie draft and we are now less than three weeks away from many of those drafts kicking off. Once our respective dynasty teams are eliminated from contention, and sometimes even before, we tend to turn our attention to the incoming rookie class and delusions of grandeur take over. In fact, dynasty players spend nearly the entire off-season preparing for how they will use their draft picks, or if they will use them at all. 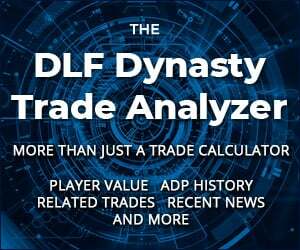 In this twelve-part series, I’ll use the latest data available here at Dynasty League Football, namely our April Rookie ADP and the Dynasty Trade Finder, to ensure you are as prepared as possible when your draft begins. Based on our most recent ADP data, I’ll suggest the player you could be soon adding to your team, and if you don’t like that, I’ll also include a potential pivot option. Also, I’ll include options based on the updated 2QB rookie ADP for those who play in that format. Finally, using the Dynasty Trade Finder, I will examine some recent trades that have taken place with each specific draft pick. Each trade is based on 12 team PPR, one QB leagues. We all know the first round of rookie drafts includes the players we’ve been hearing about for months, if not years, but difference makers can be found in the second round and beyond, as well. Because of that, I’ll also address the other picks that accompany each respective first-round draft slot.